Current fans and prospective owners of the Luyben ligature will be pleased to learn that recent manufacturing refinements have made the popular B-flat clarinet ligature even better than it was before. Luyben ligatures are manufactured under the supervision of Luyben Music, Kansas City, Missouri. Tighen firmly-threads will not strip. Ligature will not slip. Until late in 1996, patented Luyben ligatures had been produced using the original molds, which were fabricated in the mid-1960's. Like any tooling, the molds began to show wear with use, and action was taken when that wear began having a noticeable effect on quality. New molds were created utilizing a manufacturing resource not available in the '60's - computer technology. With the use of computer-aided design and manufacturing, the resulting product has been deemed by clarinetists to be even better than the original. Customers from all over the country are pleased with the new ligatures. The lines are sharper and more precise, and the clarinetists we've talked to have found that it conforms closer to the mouthpiece and performs better all around. Introduced in 1965, Luyben's ligature allowed the reed to vibrate more freely, due to its unique "soundpost" design - small circles inside the ligature that distribute even, vertical pressure with as little surface area as possible touching the reed itself. Additionally, its two contoured adjusting screws give the player the ability to regulate the tension on the reed for a custom setup. Although the ligature's design remains the same, it was recently discovered that the original mold, while close, was not exactly to Bob's original specifications. We wear more computer technology on our wrist right now than was available in 1964. Before CAD/CAM, it was just impossible to make tooling that precise. Thanks to computers, the new tooling affords an almost absolute recreation of the original design - with noticeably better results. The Luyben ligature's broad range of colors is another new feature. 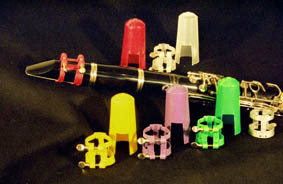 Aside from black and opaque, clarinetists can now choose from red, blue, green, yellow, purple and silver. Each ligature is sold with a matching Luyben mouthpiece cap.